Albert is listed on the Penn Road Wesleyan Chapel memorial as one of the local men who survived, but this appears not to have been the case. Albert was born in Pattingham, Wolverhampton in 1889, the son of Edward and Hannah Thomason. They were living at Lower Penn in 1901, with Albert’s brothers John and Harry. By 1911, they were living at Merry Hill, Compton, along with Albert’s sister, Mary Jane. Albert was a farm labourer. At some point be worked for Mr F. Keay, of the Oxbarn Farm, Bradmore. Albert enlisted with the 1st/6th Battalion of the South Staffordshire Regiment (number 3447). He took part in the “memorable attack with which Midland divisions were particularly identified”, but after throwing bombs for four hours, he was shot, and killed in action in France on 13 October 1915. Details of his death were included in the Midland Counties Express on 11 December 1915. He is commemorated on the Loos Memorial, as well as on the St Philip’s memorial in Penn. The son of Jeremiah and Jeannie Mason, Charles was born in Wolverhampton in 1891. In 1901 they were living at 7 Johnson Street, Wolverhampton, along with Charles’s sister, Louisa. They were at 21 Culwell Street by 1911, with an additional child, Laura. Charles was a labourer working on the railway, and at some point he was working as a Goods Porter at Wolverhampton station for the London & North Western Railway. Charles enlisted with the 4th Special Reserve Battalion of the South Staffordshire Regiment (number 38175). He was wounded, and died on 20 May 1918 in the War Hospital in Gent, Belgium. He is buried at Gent City Cemetery and remembered on the Wolverhampton Railway Station memorial. The son of Joseph and Mary Reynolds, William was born in Wolverhampton in 1889. In 1891, they were living at 61 Prestwood Road, Heath Town, together with William’s siblings Agnes H., Joseph, Andrew, John, Mary I., and Abraham. When he grew up, William worked at the Culwell Works, Heath Town. William enlisted in the 1st Battalion of the Grenadier Guards (number 14848), and being a Reservist he was recalled to the colours in August 1914. He was wounded in his left hip and taken prisoner at St Quentin on 31 August 1914. Unfortunately, whilst a prisoner of war, he was taken ill with a fever, and died on 15 October 1915. He was buried at Cologne Southern Cemetery, and he is presumably the W. Reynolds on the Heath Park memorial. 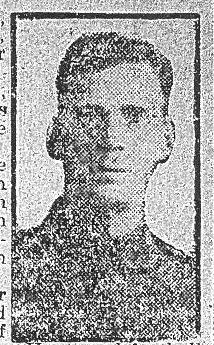 His photograph and in identical article appeared in both the Express & Star on 4 January 1916 and the Wolverhampton Chronicle on 5 January 1916. Edwin was born in Cardiff in 1892, the son of Edward and Fanny Bruerton. The family were still in Wales in 1901, in 18 Lincoln Street, Canton, Glamorgan, and Edwin appeared with his parents and siblings Florence May, Minnie and Fanny. Edwin’s parents had moved to Wolverhampton by 1911, to No 9 No 2 Court Walsall Street, however Edwin was elsewhere. In 1908 he had enlisted with the South Staffordshire Regiment, so he appeared in 1911 at Whittington Barracks, Lichfield (although his surname was given as “Brewerton”). His parents later lived at 29 Union Mill Street. He was serving in South Africa when war was declared. He was with the 1st battalion (number 8590), and was said to have been the tallest man in the regiment. An article dated 11 December 1915 in the Midland Counties Express stated that he was a very good shot and had won prizes for his skill, as well as being a member of the regimental football team. He served in France for a few weeks, before being killed in action on 7 November 1914. However, official news of his death did not reach his parents until nearly a year later. He is remembered on the Ypres (Menin Gate) Memorial. Arthur was born in 1886, the son of Richard and Mary Jane Cadman. In 1901, they were living at No 1 Mount Pleasant/Bilston Road together with Arthur’s siblings Harry, Thomas, Florence, Georgina, Lily, Samuel and Joseph. By 1911, they were at 341 Bilston Road, and Arthur was a labourer at an iron mill. At some point, Arthur worked at Chillington Edge Tool Works as an electrician. He was also a bowler with the St Silas’s Cricket Club and a member of the Chillington Works Cricket Club. He also played football for Bradley. Arthur Cadman enlisted with the Army Service Corps (number M2/078454). He died at sea on 3 November 1915. He is commemorated on the Gibraltar Memorial. 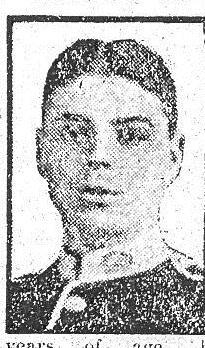 An article concerning his death appeared in the Midland Counties Express on 11 December 1915. Henry was born in Wolverhampton in 1874, the son of Evan and Frances Williams. He married Harriet Eccleshall in Wolverhampton in 1906, and the couple had five children – Joseph, Nellie, Mary Jane, Harriet I. and Harry B. In 1911, they were living at 28 Field Street, Springfields, Wolverhampton, and Henry (now known as Harry) was a maltster labourer for a brewery. They later lived at 10 Bank Street, Park Village. Having served in the South African War, Henry rejoined the 8th Battalion of the South Staffordshire Regiment at the outbreak of war (number 118923), rising to become a Corporal. He first served in France from 15 July 1915. He died on 12 October 1917 in Belgium. His medal card states that he died of wounds, but the account in the Midland Counties Express states that he was killed in action. He is remembered at the Tyne Cot Memorial. Bertie was born in Wolverhampton in 1891, the son of William and Rose Hannah or Rosannah Eden. In 1911, he was living with his widowed mother, sister Annie and brother James at 323 Prestwood Road, Heath Town. He was a labourer, and at some point he wirked at the Culwell Works of Messrs. J. Evans and Sons. He enlisted in the 8th Battalion of the South Staffordshire Regiment (number 31875). However, on 12 October 1917 he was shot by an enemy sniper in Belgium and killed. He is remembered at the Poelcapelle British Cemetery, as well as on the Heath Park memorial. 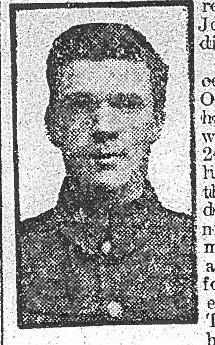 He was featured in the Midland Counties Express on 10 November 1917. Sidney was born in Wolverhampton in 1893, the son of John and Mary Dark. In 1901 and in 1911, he was living with his parents at 226 Lea Road, Wolverhampton, along with his sisters Evelyn, Elsie May and Amy Elizabeth, and brother Geoffrey. Sidney was a press tool maker. On 22 October 1915, he enlisted with the Army Service Corps (number 134524). By this date, his trade was a turner. He served in France from 21 November 1915 until 18 January 1919. Sidney married Hannah Tanswell in 1919, and they had two children, Clifford S. and Hylda M., in 1920 and 1924. Sidney died in Wolverhampton on 27 May 1939 at the age of 45. By the date of his death, his address was 56 Osborne Road, Penn, and the value of his effects was £971 9s 10d. His First World War service was honoured on the memorial from Penn Road Wesleyan Chapel. Louis was born in Wolverhampton on 28 May 1896, the son of William and Laura Caddick. They were living at 2 Graisley Hill in 1901. By 1911, they were living at 63 Graisley Row, Wolverhampton, along with Louis’ siblings Violet Dorothy, Laura Magdalen, Lillian Isabel, Will and Harry. By this date, Louis was a butcher’s errand boy. Louis enlisted first with the Royal Army Medical Corps (number 2550) and later with the Northumberland Fusiliers (number 55690). He first served in France from 16 July 1915. Louis survived the war and is mentioned on the Penn Road War memorial as one of the local men who served. Louis married Martha Freda Anderson on 6 October 1919 in Wolverhampton. They had four children – Roy Louis, Peggy Arline, Kenneth William and Karl Raymond – between 1921 and 1926. The family emigrated first to Canada (arriving December 1920, and later to America, arriving in Noyes, Minnesota on 25 February 1922. Louis later worked for Wallace Barnes Co, Bristol, Connecticut. He became naturalised on 8 February 1939. In 1942, he registered for the draft in World War Two, by which date his address was 119 Henderson Street, Hartford, Connecticut. Louis died in Connecticut in 1978.